Millionaire businessman Mitch Garber has proposed to lower dropout rates in Quebec by paying graduates $1000. CBC Homerun host Sue Smith discusses this proposal with Westmount High teacher Robert Green. While education professionals are ignored there is no shortage of hair-brained reforms being proposed by millionaires and celebrities. In the Motherhood host Trixie Dumont discusses the Couillard government’s attacks on public education with teachers Fernand Deschamps, Robert Green and Chantal Kers and parent Stacey Dumont. Interview from the October 7th edition of CKUT’s The Wednesday morning after. 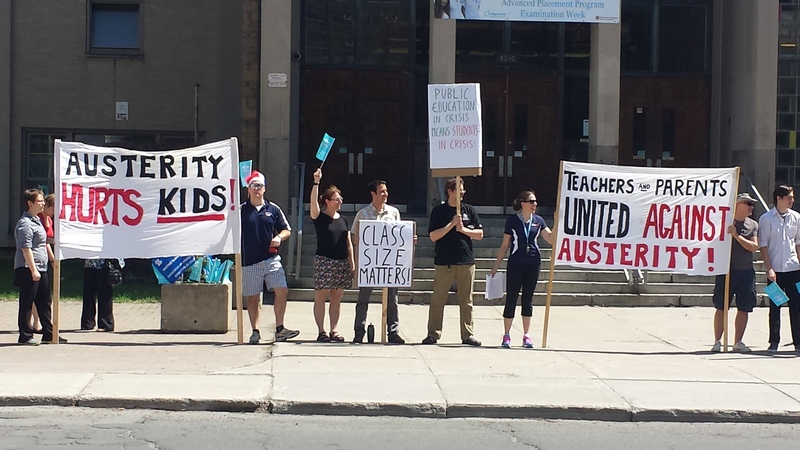 Teachers are angry that Quebec wants to increase class sizes in high schools and elementary schools and is proposing to no longer consider whether a child has a learning disability when calculating class sizes. A few months before negotiations began in March on a new collective agreement with the province’s teachers, former Education Minister Yves Bolduc told reporters there was no clear link between smaller class sizes and student performance, citing a 2008 Université Laval study. The government also wants to increase the work week from 32 to 35 hours and is offering a three-per cent wage increase over five years. MONTREAL – Lunch hour is usually a time when students are free from their teachers – a time when they get to chat with their friends, grab a bite to eat and talk. 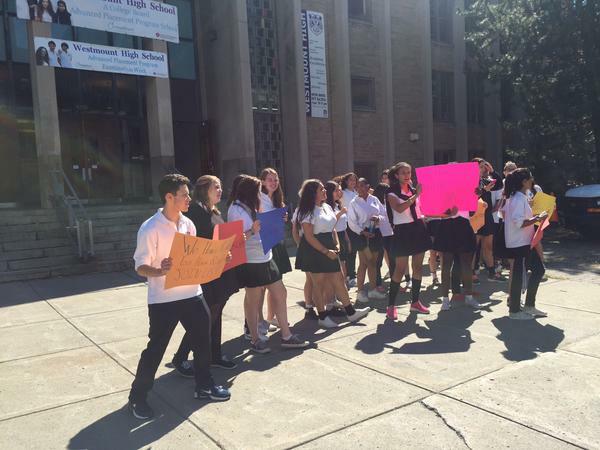 But Westmount High School students did something a little different on Tuesday. A group of about 40 students gathered in front of the school in support of their teachers, saying work-to-rule action is not allowing teachers to properly do their jobs. Earlier this month, an extensive study commissioned by Ministère de l’Éducation, du Loisir et du Sport confirmed what Quebec’s teachers have known for over a decade: The famous “pedagogical reform” that was supposed to revolutionize the way students are taught in Quebec is a failure. The study, which followed nearly 4,000 students, compared two cohorts of post-reform students with one that entered high school in 2004 just before the reform was implemented. The results paint a portrait of an ongoing policy disaster. Despite having added 50 hours of instruction in Mathematics and 150 hours of first-language instruction, results in both core subjects are significantly down. Despite the fact that the reform was intended to raise the dismally low graduation rates of boys and at-risk students, these rates have instead seen significant declines for both groups. Perhaps most worrisome for Quebec’s anglophone community is the fact that students in Quebec’s English school system were also identified by the study as one of the groups that saw a significant decline in graduation rates. In other words, the millions of dollars spent developing and implementing this reform have been an utter waste of public funds. During his most recent election campaign Quebec Premier Phillipe Couillard stated that protecting the quality of education would be one of his government’s main priorities. It is now clear, Phillipe Couillard was not telling the truth. Since coming into office he and his hapless Minister of Education Yves Bolduc have done nothing but propose policies that will harm the quality of education in Quebec. By insulting teachers with a contract offer that will likely see their real wages eroded by at least 7 percent over five years, the Couillard government is sending a clear message that it does not value the teaching profession. 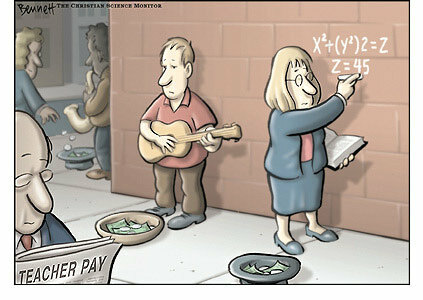 Quebec’s teachers are already the lowest paid in Canada with some of the most difficult working conditions. If this initial offer is any indication, the government is intent on ensuring that this wage gap with teachers in other provinces not only remains but in fact widens. What is the cost for students and for society as a whole when high quality teachers are driven out of the profession, or worse, when high quality candidates choose not to enter the profession in the first place? Sadly, if Couillard has his way, we may soon find out. Perhaps even more insulting to teachers is the government’s proposal to increase our workload. What Mr Bolduc doesn’t seem to realize is that past increases to our workload have made it such that teachers already cannot accomplish the task they have been assigned within the hours they are paid. Despite this fact, the vast majority of teachers, because they are committed professionals, choose to take marking home to do during evenings and weekends. It is also extremely common for teachers to use their sick days to catch-up on marking. Each time teachers do either of these things they are in effect making a personal donation to Quebec’s public education system and helping to cover-up the fact that past governments have not made adequate investments in education. To threaten to increase the workloads of teachers in such a context where the vast majority of teachers are already working an untold number of unpaid hours from home demonstrates that Couillard and Bolduc are either utterly ignorant of the realities of Quebec’s teaching profession or reckless ideologues that simply don’t care. The government is risking alienating teachers to the point where we stop working hours for which we are not paid. If that happens we will not need to strike because the system, which is being propped up by the thousands of volunteer hours donated by Quebec’s teachers, will fall apart. Perhaps the most obvious example of the Couillard government’s total disregard for public education is his proposal to remove limits on class size. This was accompanied by Bolduc’s astonishing claim that there is no evidence to suggest that class size reductions improve educational outcomes. That Quebec’s Minister of Education is unversed in the enormous body of research demonstrating the contrary is disturbing enough; that he apparently didn’t even bother to do a little research before making this announcement demonstrates a shocking level of disregard for the public interest. Of course the government claims that these tough decisions are necessary to tame Quebec’s ballooning deficit. The problem with this claim is that in many places around the world where such austerity measures are being implemented economic growth is harmed and deficits end up growing. Since 2012 the IMF has made repeated warnings against further austerity because of its demonstrated capacity to harm economic growth. The other problem with the government’s claim is that our current deficits were not in fact caused by spending. Since the early nineties government spending in Quebec has been trending downward. Quebec’s public sector has time and again done its part to help government achieve the goal of deficit reduction. The real cause of our current deficit is a series of tax cuts enacted since the early 2000’s that have disproportionately benefited Quebec’s wealthiest citizens to an enormous degree. For example, according to L’Institut de recherche et d’informations socio-economique (IRIS) the $950 million in tax cuts the Liberals offered in 2007-2008 provided absolutely nothing to households with $25,000 in income, $110 to households with $50,000 in income and a whopping $1859 to households with $150,000 in income. The cut to taxes on capital gains which began in 2005-2006 was essentially a massive gift to the banks that deprives Quebec’s public coffers of 1.9 billion annually. Reversing these two tax cuts alone would almost eliminate Quebec’s deficit. Instead, Couillard is asking vulnerable public school children to pay for these tax cuts. This is not a necessity; it is a choice he is making. If Couillard wants Quebecers to believe that he is anything other than a reckless right-wing ideologue intent on protecting the interests of the wealthy he should explain how cutting a public education system that benefits all Quebecers is preferable to reversing these tax cuts which have benefited so few.